WHY we were buying it. she ever so gently reminded us. a jennaire indoor grill and wacky orange and gold wallpaper. Now THAT sounds like fun on a stick! Now...No beauty queen awards...but injected a bit of personality. I am allergic to upper cabinets ( yes. note from doc to prove it)...so they came down within a month. was found at Habitat Homestore...$5 bucks. Tried to use it in bathroom re-do 1. No go. Tried again in bathroom 2. Still no go. There was a gate around the pool (gone). they lovingly built the house. And I have to say it is built like a tank...no expense spared in that dept. Yet...Another part of the kitchen. I know, I know...a red (??) hood! underneath it is aluminum...like an old airplane's body. But this... this is my most fave part. The guest house. The yard was mud...well a few trees and mud. If you look closely...you can see the disgust on her face (hee) In her defense... I was having some major trepidation right then too! You put a lot of work into your lovely home and it was worth it - it's gorgeous! WOW...can I come live with you? It looks like you did an amazing job! Remodeling is such hard work, but YOUR end result was indeed FABULOUS! Oh, my gosh! I have always loved photos of your home, but I had no idea how far it had come! You are amazingly creative and talented, Linda. Wow. Loved this post! I love before and afters!!! You have great taste and a great eye on what to salvage and what to toss. Good job! oh WOW. I love the changes you have done...can't wait to see more! I love your style! I am a huge fan of B&A and you did a fantastic job. Love that you posted it all here to share with us. Give yourself a huge pat on the back girl! Love everything you did! I like the red hood the way it is. Adds a bit of punch to the color scheme. Although I have the change bug also! Wow it looks so gorgeous...did you see all the snow in the post before Rhoda's party...we are buried cold white stuff and your home looks like you live in a paradise! I love all the changes and adore the red hood:) you are doing a fantastic job!!! 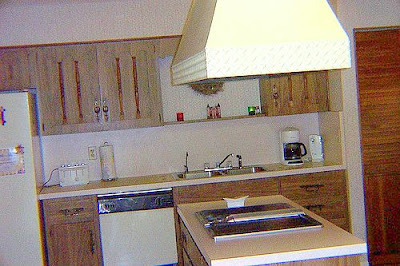 Before and afters are the best - absolutely love your guest cottage and it is hard to believe the kitchen is the same, xv. I love how personal your home is. It has so much personality and seems to be a wonderful of expression of you and your own style. I love that you're not afraid of color and art and all kinds of details. It is so much fun to look at! Absolutely beautiful! I love the shelves you did instead of cabinets, so pretty! You have such an amazing home. love everything you've done - you have the vision. I would never have known this home was so new .....and I'm thinkin' not so humble as you suggest...? wow what an amazing accomplishment. It inspire me. my beach cottage in the land of red is slowly coming, so it is great to see all your work paying off. WOW! It is beautiful!!! And I love your red oven hood. Cool! Your house is beautiful. Great job. Love the color you painted the outside. 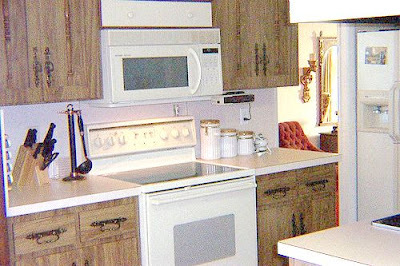 Awesome before and after pictures of your dreamy we-all-wish-we-were-there home! Love your blog. Wow, Wow, WOW!!! I love everything you've done to your now beautiful home! Love the red hood! And I love the color of your guest house- oh heck, I love that you "have" a guest house- how cool is that?!! Fabulous before and afters! I enjoyed your blog, your style and wit! Happy New Year from Houston, Texas! What a fantastic cottage - you have VISION! You have a beautiful house. I know because I've been there. It's even more amazing seeing the work you have done and your eye for detail. Oh BTW... who takes your photos? You are so talented! i'm a beach girl...and i love your home. gorgeous! i esp. love your kitchen. What a fun party Rhoda is hosting! At first glance I thought you may live in Hawaii!Florida is great!! Oh, gosh, Linda, how great! Love these photos! Linda I love how you saw a diamond in the raw. I love what you did with the place. It looks like a piece of heaven! Aaaaaaah, Linda, a walk down memory lane. I still think you should have picked up some extra cash renting it to a movie production company making a "70's retro movie" before you worked your magic. And I do think people will agree that what you've done with this house IS magic. YOU are a woman with vision! you know how much I love your home. all of it, even the red hood which I think is wonderful! wow! great before and afters. everything looks wonderful. thank you for sharing! I love that your house has personality, the red hood on the stove is too cool, and the open shelving to display your kitchen stuff is fun to look at - how many years did it take for all your changes? I remember first coming to your blog when you posted a photo of your bathroom....so creative. Your home is a dream house to me, Linda! You have such vision and such innate style! It's gorgeous. I know I've said it before...from way back at GW...but had to say it again. I love to see before and afters. Yours are stellar!!!! Thank you for the birthday wish yesterday. you rock linda, its absolutely gorgeous. I heart your house, Linda. And guest house. Everything you do or change turns to gold. You guys did a FAB job on the reno! ahh your fabulous garden: a tropical paradise!! Man....You all are just TOO nice. Thank you so much...It sure feels like eating humble pie putting your stuff out there. Especially stuff that is kinda different...kinda homeade. I am surpised by how many like the ed hood. Go figure. I liked it too...but then thought I was just used to it! Emily. YES they crumbled when you would wipe them down. Ewww.Yuck! Denise (permission to Mother). I take my pics...very amatueishly, but learnin'! Linda Lou. We've been here 5 years. Some changes happened off the bat, others just happened. Most of the kitchen happened last Christmas...installing granite Christmas eve if you can believe! But the whole thing was mainly done within the week. Thanks again for all of your kind, over the top comments! You are all the Cat's Pajamas in my world!! Linda, you really are talented with the redos. I don't remember seeing your kitchen before either, but WOW at the changes. I love them all, including that red hood. your little guesthouse is to die for too. what an oasis you have there in FL. Thanks for playing! Linda I am just now getting over here. I have always loved your home. The magic you've worked is truly amazing! I am in awe!! Gawjus, Darlin'! I just love your place. I'm heading down to FL next month, but I'm going to be way north of you in St. Augustine. Darn it!! It would have been fun to hook up. 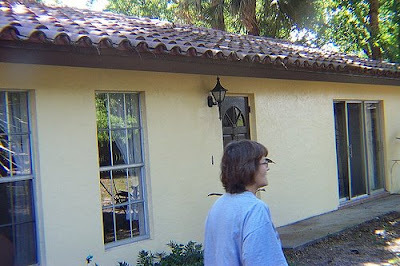 What beautiful amazing changes around your lovely home Linda! WOW - You guys are GOOD! Many blessings to you, your family and your beautiful abode this new year! Wow..it looks just wonderful! I mean wonderful!!! Wowie!! I can't believe that's the same kitchen, Linda - and your guest house is wonderful. I love the color against all that lucious green! Absolutely gorgeous and I must say, I love the red hood just the way it is! Have I told you that I seriously cover that backsplash? It's fantastic!!! Wow! What a difference! You have incredible vision and taste. 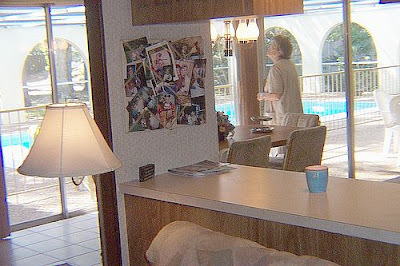 Linda--your remodeling work inspires me! I think I need to have you over to lead me in the right direction!! I am in LOVE with your back splash in front of your sink. That is like the cutest thing I have ever seen! I also love your faucet. So cool! You are so creative and a very talented lady. Thanks for letting me stop by! I've been going down the list of top 10 projects and yours is the first I've commented on. I LOVE your backsplash and your faucet! It is wonderful! And I love your hood with the diamond plating. that was fabulous! but i am still twisting my head like the victrola dog, when you say backsplash, as in your adorable kitchen fish, you got that for 5 bucks and still didn't even like it??? that is so fantastic i must not know what a backspalsh is... its so unique, i love it... great house color too~ fun fun fun makeover! Blue Moon....what I mean by back splash is the diamond shaped tile with the little round tiles in between. I only had that amount, and kept trying to use it in each bath remodel we did...to no avail. So, on a whim we put it up behind the faucet (it was a real bear too, each one was hand made and different sizrd!). At first i was not lovin' it. Now the fish tray...Him i love. Used to be in the cabinet, put him there one day. And there he happily sits! Thanks EVERYONE for your amazing comments and support! ...and to Rhoda for hosting the before and after!! Love your home - you did an amazing job! I know the hard work that goes into doing a project like this. We spent 3 years on our 1890's transformation and still have things to do. It's a money pit. Check it out on our blog archive - the rescripted house. It was my very first post so it's in the 2008 archives. Thanks for the comment which brought me over to your blog. Glad to have found you. P.S. You know that milliner's table could be yours! Oh what a lucky, lucky house! Fab in EVERY way! Beautiful, gorgeous! What amazing vision you had for it. I love the red hood. It's so unique. Wow! Just beautiful! It's my dream kitchen. Definitely one for the style files.